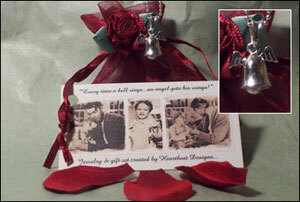 Child star Karolyn Grimes “Zuzu Bailey” of Frank Capra’s classic movie “It’s A Wonderful Life” commissioned Georgene of Heartbeat Designs to create a magical gift set for her famous line in the movie……”Every time a bell rings an angel gets his wings.” Now, IAWL fans called “Lifer’s” can wear their own sterling silver bell with wings…that’s endorsed by Zuzu Bailey! The charm is on a smooth 18″ snake chain beautifully packaged in a ruby organza rosebud drawstring pouch and included are 3 Zuzu’s petals! The front of the card depicts classic clips from the movie of Karolyn with her on-screen dad Jimmy Stewart. The back of the gift card has a picture of Karolyn Grimes today!!! While you wear your charm, the pouch and Zuzu’s petals can be hung on your tree! This will be a cherished keepsake for many years to come! LOS ANGELES —George Bailey’s brother proclaimed him the richest man in Bedford Falls. Now the story of the despondent businessman, who got a chance to see how ugly the world would be without him, has been proclaimed the most inspiring American movie.